These were our outfits I think we scrub up quite well when needed! The shrug didn’t stay on long because it was roasting at the hotel! When we got there I was very glad to find out they hadn’t started eating I was worried we were late. There was a large beautiful table plan and we were easily able to find our table. So off we went to find table 8. Our place names were little keyrings with our names on. I absolutely loved how quirky and inventive that was. I kept thinking oh gosh are we going to be on a table by ourselves but a couple minutes later a lady with the biggest grin and sparkly eyes came over and introduced herself as Donna. Lauren told me I would be sat next to her and I’m so glad I was! #northerngirlsunite then four other people joined us soon enough but I feel so bad because I can’t remember their names sorry! The menu was on the table so I snapped a picture so I didn’t have to worry if my phone died before the meals! I was suffering from a blockage on the Saturday so I didn’t eat much and definitely didn’t dare eat the vegetables especially since I know onion is a no no unless finely chopped! However the potatoes were to die for! Each table had a selfie stick which was an awesome touch, shame we were just naff at using them!! This was mine and Donna’s attempt and I just forced 00Steve into one! Afterwards we listened to Lauren’s story and what inspired her to create the charity. We saw how well the charity has progressed in the last year and that the charity is now registered #1167169 which is amazing. Then we heard from a beautiful young women called Amy who had a lot of the mum’s in the room wiping away tears from her struggle with depression after being ill. You are a strong woman and should be proud of yourself. Then the thank you’s were done for the guest speakers and the amazing set of people that work with Lauren at the charity. She made special note to her dad and her husband, it may have been coincidence but the day of the ball was the anniversary of when they first met which was adorable. Then the party started! I had to have a toilet selfie at an ostomy/IBD event! 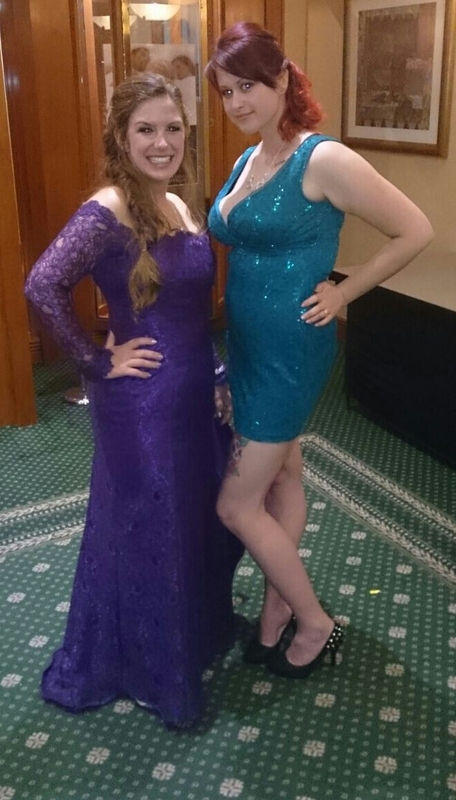 So that was with Stoma Style’s Lisa she looked every bit a beautiful mermaid! 00Steve and I spent A LOT of time chatting to Jasmine about games and consoles etc and one of the kids she used to (maybe still does) nanny. She is so funny I genuinely loved geeking out with her even if she plays more 00Steve’s sorts of game than mine but I will let her off lol! I spent ages hunting down Lauren for a photo! I mean it had to be done really the lady of the evening in her handmade purpose planned dress! She just looked stunning! I did want one with Shell but she was like this little whirlwind here there and everywhere! But I did manage to get some in the photo booth. Yes gotta love a photo booth! I do believe there is one somewhere showing off her Vanilla Blush underwear and me framing her bum! I wanted to take a photo of the calendar girls and boys but felt too shy to go and ask (which isn’t like me) I’ve definitely made some amazing new friends and had an amazing new experience. I have been inspired to do what I can to raise awareness of this amazing charity and their work, oh and hopefully raise lots of money for them too! Thank you for allowing me to be part of the amazing day and night! If you are interested part one is here. ← Purple Wings Charity Event Part One!